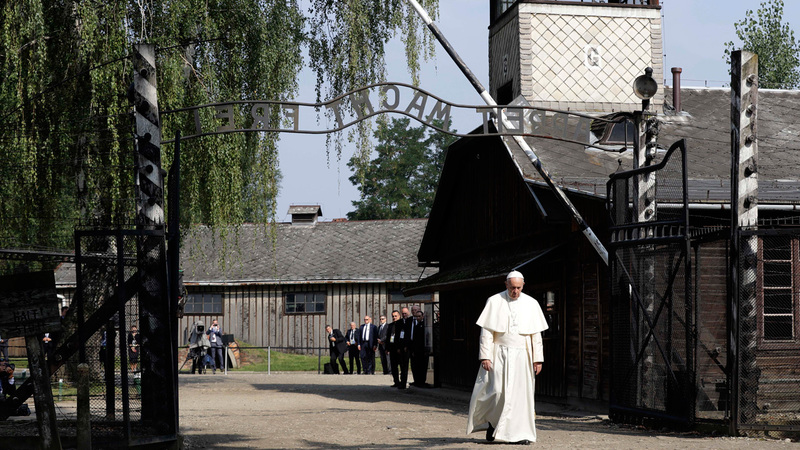 OSWIECIM, Poland -- Pope Francis paid a somber visit in silence to the Nazi German death camp of Auschwitz-Birkenau on Friday, becoming the third consecutive pontiff to make the pilgrimage to the place where Adolf Hitler's forces killed more than 1 million people, most of them Jews. Francis entered the camp on foot, walking slowly in his white robe beneath the notorious gate at Auschwitz bearing the cynical words "Arbeit Macht Frei" (Work will set you free). Video shows Pope Francis tumbled and fell as he arrived for a Holy Mass in Poland. After Auschwitz he moved to nearby Birkenau, where people were murdered in factory-like fashion in gas chambers. Altogether it was a deeply contemplative and private visit of nearly two hours that Francis passed in total silence, except for a few words he exchanged with camp survivors and Holocaust rescuers. Vatican and Polish church officials had explained that Francis wanted to express his sorrow in silence at the site, mourning the victims in quiet prayer and meditation. However, he did express his feelings, writing in the Auschwitz memorial's guest book in Spanish: "Lord, have pity on your people. Lord, forgive so much cruelty." As an Argentine he is the first pope to visit Auschwitz who did not himself live himself through the brutality of World War II on Europe's soil. Both of his predecessors had a personal historical connection to the site, with the first, John Paul II, coming from Poland and himself a witness to the unspeakable suffering inflicted on his nation during the German occupation. His successor Pope Benedict XVI, who visited in 2006, was a German who served in the Hitler Youth for a time as a teenager. Francis prayed silently for more than 15 minutes before meeting with several survivors of the camp, greeting them one by one, shaking their hands and kissing them on the cheeks. He then carried a large white candle to the Death Wall, where prisoners were executed. At the dark underground prison cell that once housed St. Maximilian Kolbe, a Polish Catholic friar who sacrificed his own life during the war to save the life of another man, Francis prayed again. A few shafts from a tiny window were the only light cast on the white-clad figure. He then traveled the 2 miles (3 kilometers) to Birkenau, the vast satellite camp where the Nazis murdered Jews, Roma and others from across Europe. Invited guests, among them camp survivors and Christian Poles who saved Jews during the war, stood in respect as the pope arrived, his vehicle driving parallel to the rail tracks once used to transport the victims to their death there. At one point the deep silence was broken only by the wailing of an infant. When Francis arrived, the hundreds of guests gathered applauded. Francis slowly observed each of the memorial plaques in the 23 languages used by the inmates. Poland's chief rabbi, Michael Schudrich, then recited in Hebrew Psalm 130, which starts: "From the depths I have cried out to you, O Lord." Francis clasped his hands and bent his head as the psalm was read first by the rabbi and then by a priest in Polish. John Paul's visit in 1979 made history because it was the first ever by a pontiff, part of the Vatican's historical efforts at reconciliation with Jews. As a pope hailing from another continent, Francis's visit helps to underline the universal importance of a site that in recent years has drawn ever more visitors from around the world. The millions who now visit have put increasing stress on the aging barracks, prompting urgent conservation efforts that are being funded by governments worldwide. Francis' visit is also different in that it had a private character with no speeches. Benedict, for instance, spoke there in 2006 in Italian - pointedly avoiding his native German language - in a speech in which he questioned why God was silent at the slaughter of so many. The visit to Auschwitz came on the third day of a five-day visit to Poland that includes meetings with young pilgrims taking part in World Youth Day, a global youth celebration. Friday is devoted to the theme of suffering. Later in the day Francis will visit a children's hospital in Krakow and take part in a Way of the Cross with the young people. He has become the third consecutive pontiff to make the pilgrimage to the place where Adolf Hitler's forces killed more than 1 million people, most of them Jews. But Francis is the first pope to visit who has no personal connection to the site. John Paul II hailed from Poland, which was under German occupation, while Benedict XVI was a German. 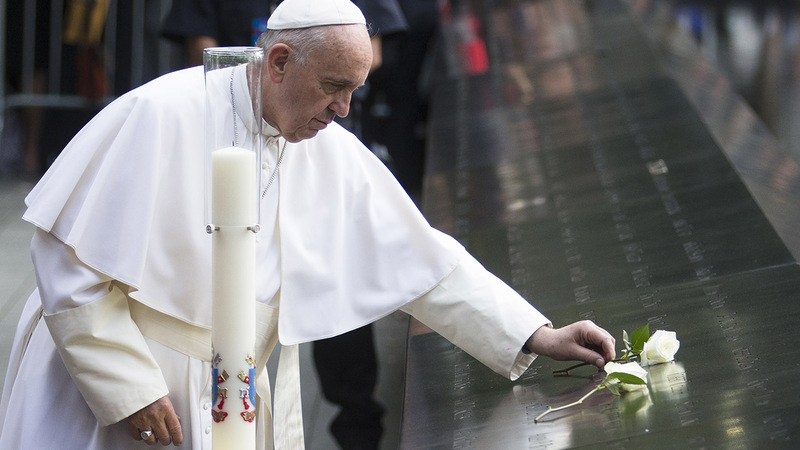 See photos from Pope Francis' visit to the 9/11 Memorial and Museum in New York. 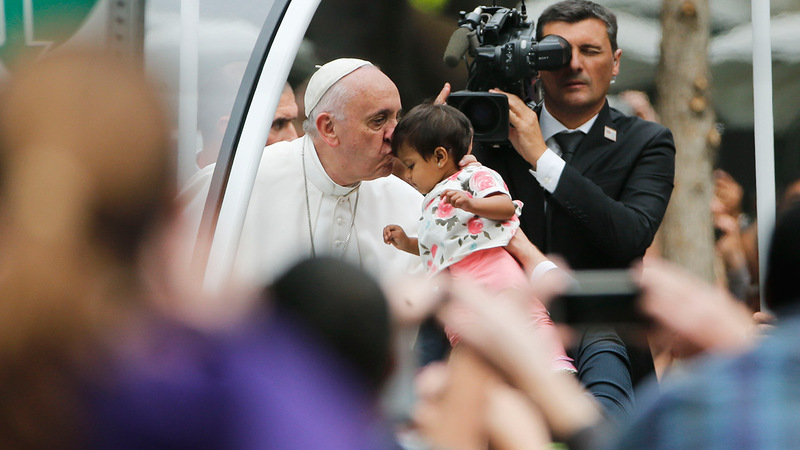 Our favorite photos from Pope Francis' visit to Washington D.C., New York and Philadelphia.